PortSide NewYork is a living lab for better urban waterways. WE bring WaterStories to life. We manage the historic ship MARY A. WHALEN, the world's only oil tanker re-purposed for public education and culture. PortSide NewYork connects New Yorkers to the potential of their waterfront, with a special focus on reaching the underserved. We work to change NYC policy so that maritime activity of all kinds (recreational, educational, commercial) is more a part of waterfront revitalization plans. Check out the blogpost with information about our January 8, 2019 presentation of our business plan to the NYC EDC to expand from our ship, the tanker MARY A. WHALEN, into adjacent warehouse space. This space was previously promised to us by the NYC EDC from 2008 through early 2011; they requested this business plan as a means to get the space. This space would make PortSide the year-round facility we have long intended, a better asset for the Red Hook community, an amenity to users of NYC Ferry and Brooklyn Cruise Terminal in Red Hook, visiting New Yorkers and tourists. If you want to see this happen, send an email of support to Allison Dees at the EDC at adees@edc.nyc and make sure to copy us at chiclet@portsidenewyork.org. Thanks! PortSide creates innovative and inclusive maritime programs. Visit us for a "waterfront access" experience that's different since we are NOT IN A PARK. In Atlantic Basin, Red Hook, we are part of an authentic, dynamic working waterfront with maritime action. See ships come and go, watch the containerport cranes. Walk our pier with the most varied collection of historic and working vessels on one NYC place. Daytime TankerTime open hours on the main deck of our oil tanker are a hit with kids and adults. Second Sundays TankerTime runs 5pm to midnight (May thru Sept) with a Mediterranean music jam. Our award-winning programs include serious subjects (Mariners' Response to 9/11) and performing arts such as the Puccini opera aboard the MARY A. WHALEN which we positioned as a "containerport appreciation" event. We offer maritime-themed "WaterStories" film screenings, talks, book readings and exhibits. We have programs for school students and the general public. We also create programs off our ship in parks, storefronts, industrial sites, and on other historic ships, and the e-museum below. Creating a pipeline to marine careers is part of our mission (see below). 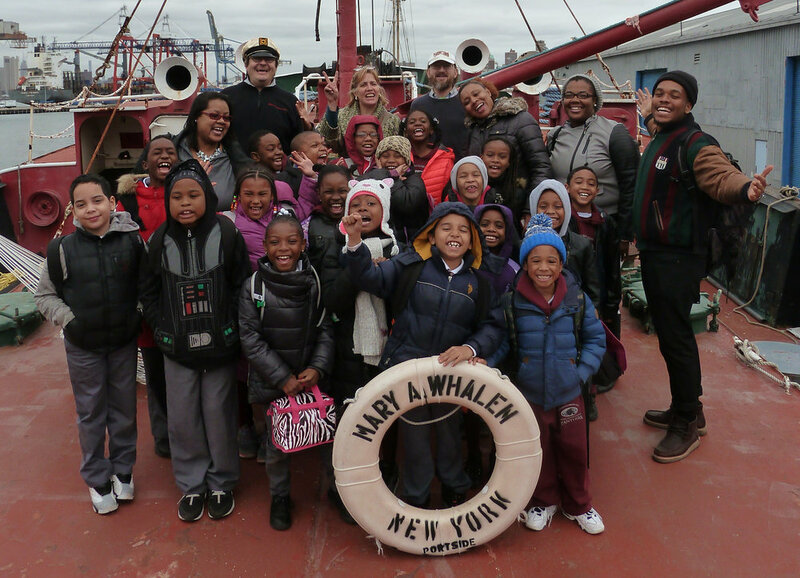 In May 2018, we launched an African American maritime heritage program. Our education programs serve students from elementary schools to PhD candidates, from low-income New Yorkers to students from private schools overseas. Visit Red Hook WaterStories, our e-museum with 400+ years of coastal history plus a guide to contemporary Red Hook. If you live in NYC, whether you are in a flood zone or not, please read the flood prep info in Resiliency 101. You never know when you, your family or your friends will need to know how to cope with a major flood; and doing your homework once the flood is forecast is too late to prepare well. We provide CTE (vocational) internships that develop life skills and job skills. The Williamsburg High School of Architecture & Design has been a partner for several years. We have a training partnership with the union District Council 9 that uses our ship as a training site, primarily for Local 806, the Bridge Painters. We have worked with several of their other locals. Starting in late 2012, in response to the destructive WaterStories of hurricane Sandy, PortSide stepped up to offer recovery and resiliency work for our neighborhood of Red Hook, Brooklyn. We were honored for our recovery work by the Obama White House and the NYS Senate. Our recovery work included protecting the ship from damage, and serving hundreds of Red Hook people. Our resiliency work has helped thousands. After five years, we concluded that work and are now focused on own Sandy recovery project that was finally approved by FEMA in late 2017. We need to raise $26,000 (10% of the cost) to complete the project, so please donate! We have a great ship cat Chiclet who attracts visitors from Red Hook and far away and keeps the ship rodent-free. Get the satisfaction of helping make the world a better place while getting on the waterfront away from the roar of the city. Join us as a volunteer. The options include shipwork, space design, space organization, grant writing, volunteer coordinator and more. Join us as a member of the board, advisory board or fundraising committee. Bring us your ideas, connections and energy. It's fun around here! 2017 Congresswoman Nydia Velazquez presented PortSide with a Congressional Record citing the importance of the ship MARY A. WHALEN and PortSide programs. 2014 Appointed by Councilman Carlos Menchaca to the Sunset Park Task Force to advise the NYC Economic Development Corporation about development plans for the South Brooklyn Marine Terminal. 2013 National Maritime Historical Society "New York Harbor Historic Ship Steward Award of Excellence"
2013 Appointed by Governor Cuomo's office to Red Hook's NY Rising committee, a statewide program to make communities more resilient. PortSide partners with Red Hook's P.S. 676, provides programs for all grades.